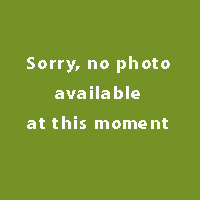 This cake blooms with large, bright orange flower arrows. 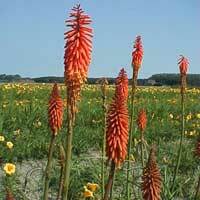 Prefers a position in full sun in a nutritious, well-drained soil. In winter all the leaves leave, giving protection from frost. In the spring can be removed. It is an upright, robust, evergreen perennial with strap-like, grey-green leaves and, in late summer and early autumn, large, terminal racemes of pale green flowers, becoming cream and then white. 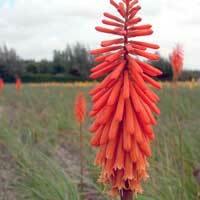 Bright and imposing kniphofia lend height, vibrancy and drama to any garden. 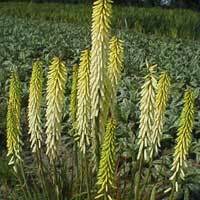 It produces slender spikes of pale yellow tubular flowers fading to ivory above clumps of evergreen, strap-like leaves from August to September. The flowers are light orange-yellow flare. Blooms reasonably long. Prefers a sunny spot and a nutritious, well-drained soil. The leaves in winter to sit for protection against frost. In the spring, then remove it. Beautifully colored spikes of electrifying coral-red flowers rise on strong stems out of a clump of narrow strappy foliage. Stately, dramatic plants for the sunny border. This plant makes a very bold statement. Loved by hummingbirds. 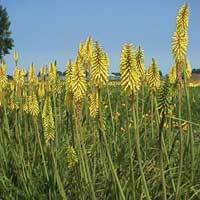 Distinctive border perennial with green tinted yellow in bud, canary yellow flower spikes on erect stems. Leaves are narrow, long, and grasslike. 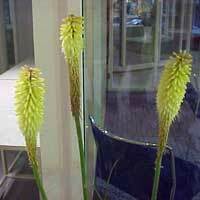 This is a sturdy, but graceful plant with few problems and architectural character. Varieties available in both dwarf and larger forms. Flowers attract hummingbirds and can be used in flower arrangements. 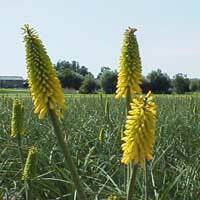 It is a clump-forming, deciduous perennial with toothed, grass-like, mid-green leaves and, in late summer to early autumn, upright racemes of white flowers opening from green buds.